Justin Meldal-Johnsen (born March 26, 1970 in Eugene, Oregon, USA), commonly known to fans as JMJ, is a session bassist, producer and songwriter, best known for his work with Beck. He has worked with a number of bands, including Garbage, Macy Gray, Tori Amos, Air, The Mars Volta, Courtney Love, Ladytron, The Foo Fighters, Frank Black and more. On June 5th, 2008, it was announced on nin.com that Meldal-Johnsen was part of the Nine Inch Nails live band. Meldal-Johnsen was born to "hippie" parents who encouraged his love of art and music. The family moved to San Francisco, California, shortly after his birth. At the age of twelve, a family friend gave Meldal-Johnsen an old bass guitar, and with the combined influence of the then-new MTV, he learned to play guitar along to the music videos on the channel. He also played along to his and his parents' music collections, whatever he could get his hands on at the time. In his high school years, Meldal-Johnsen began to branch out into discovering more "experimental" styles of music. He also joined his first band, which broke up before they even had a chance to play any gigs. He finished high school in 1987 as a straight-A student, and had higher education on the brain. Upon completing high school, he got a job at Cherokee Recording Studio as a night-time janitor. The pay was paltry, the job was tedious, but it did come with the perk of getting to meet several of his favorite musicians, including Gene Simmons and Lou Reed. It was also there that he met string arranger David Campbell, who offered Meldal-Johnsen a job as his personal assistant. Meldal-Johnsen left the studio and found himself learning the intricacies of the music industry and beginning to forge his own career in music. While under Campbell's wing, Meldal-Johnsen met Campbell's son, Beck, who was also an aspiring musician. They became quick friends and spent a lot of time together. Beck introduced Meldal-Johnsen to Tom Waits and American folk music, and showed him how to use a 4-track, which led to them recording some songs together. Around this time, Meldal-Johnsen and a drummer friend found a guitarist by the name of Tony Hoffer, and they formed a band called Last Carousel, who made the rounds in the Los Angeles party and club scene, but didn't go very far from there. They recruited a new singer and renamed their band This Great Religion, and found more success than with their previous incarnation. They managed a "decent" following, which was difficult at the time as Los Angeles was primarily a mecca for "hair metal" bands. They released two 7" singles on Rough Trade records, toured college campuses, and played some shows in Japan before they split in 1993. While Hoffer and another member went to San Francisco, Meldal-Johnsen opted to remain in Los Angeles. Between 1993 and 1995, Meldal-Johnsen began getting his footing as a musician-for-hire, playing in the studio with some artists, and touring with others. He worked with Circle Of Power and The Elastic Purejoy, among his other early session projects. At the end of 1994, he was offered the opportunity to join legendary rock band Medecine. Meldal-Johnsen appeared on the band's 1995 release, Her Highness, and joined them on a lengthy, grueling US tour. Medicine split in 1996 due to internal conflicts within the band. Prior to Medicine's split, Meldal-Johnsen began collaborating with bandleader Brad Laner on a project called Electric Company. They recorded A Pert Cyclic Omen, which was released later in 1995. At the same time, Meldal-Johnsen joined Pet, who were later signed to Tori Amos' label and were allowed to record an album at Amos' home in Ireland in 1996. In April of the same year, Beck—who himself had established a successful career—called Meldal-Johnsen and asked if he was interested in jamming together. Meldal-Johnsen soon realized it was an audition for Beck's touring band, which would be a full-time commitment. Meldal-Johnsen accepted the offer, and became a regular on Beck's albums and tours. Meldal-Johnsen went on to play on Mutations, Midnight Vultures, and Sea Change, and also became Beck's live music director. Hoffer was also called in from San Francisco to join the band at Meldal-Johnsen's suggestion, and would engineer and co-produce some parts of Midnight Vultures. Hoffer and Meldal-Johnsen were back as collaborators. In addition to Beck, Meldal-Johnsen appeared on three of Amos' albums: From The Choirgirl Hotel, Strange Little Girls, and Scarlet's Walk. In 1998 he became a touring bassist with the French group Air in support of their debut, Moon Safari. He appeared on the band's second album, 10,000 Hz Legend. When he hasn't been involved in any major jobs, Meldal-Johnsen has worked with several other artists in the studio. He co-wrote and recorded Macy Gray's 2003 release, The Trouble With Being Myself. In addition, he's done remixes for several artists and scores for a handful of films. In 2002, Meldal-Johnsen formed Ima Robot, and got a major-label deal in the same year. Their debut album was released in 2003, and the band toured extensively with several bands during that time. In 2008, Meldal-Johnsen's friend Josh Freese told him of an available position in Nine Inch Nails following a sudden departure of a recently recruited member. 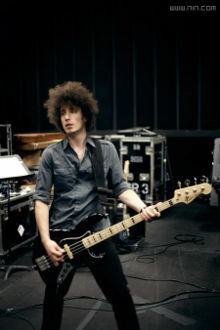 Meldal-Johnsen auditioned before NIN founder Trent Reznor and was given the position of bassist and multi-instrumentalist. He toured with NIN though 2009. Meldal-Johnsen currently lives in Los Angeles. This page was last modified on 19 December 2016, at 23:38. This page has been accessed 62,525 times.